Making ice cream at home isn’t as difficult as you might think. You don’t need an ice cream maker for all of the fabulous no-churn ice cream recipes that are hitting the best food blogs these days. 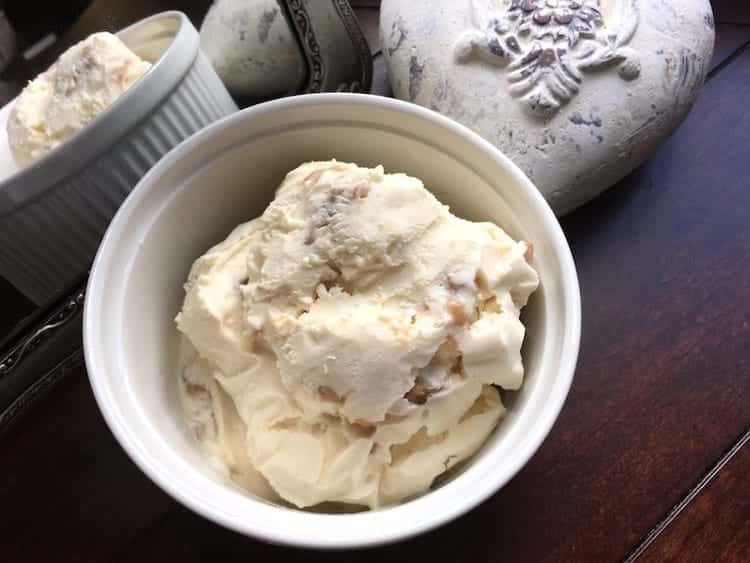 And trust us, the flavor in this Salted Caramel Pecan Ice Cream recipe is one that you are definitely going to want to make again and again. All you need are a few simple ingredients, a mixer to do the heavy whipping, a cold pan and a freezer. You might want to have a freezer on hand too…you know, that one essential ingredient that you absolutely have to have to make ice cream. It’s always fun to throw together a dessert and then get to savor each and every bite of the rewards. We love making ice cream at home and have made a few favorites: Strawberry Ice Cream, Cherry Garcia and another version of Salted Caramel Ice Cream. However, if you’re looking for a no-churn Salted Caramel Pecan Ice Cream, this recipe is the one you’ll want to scoop up onto you cone. 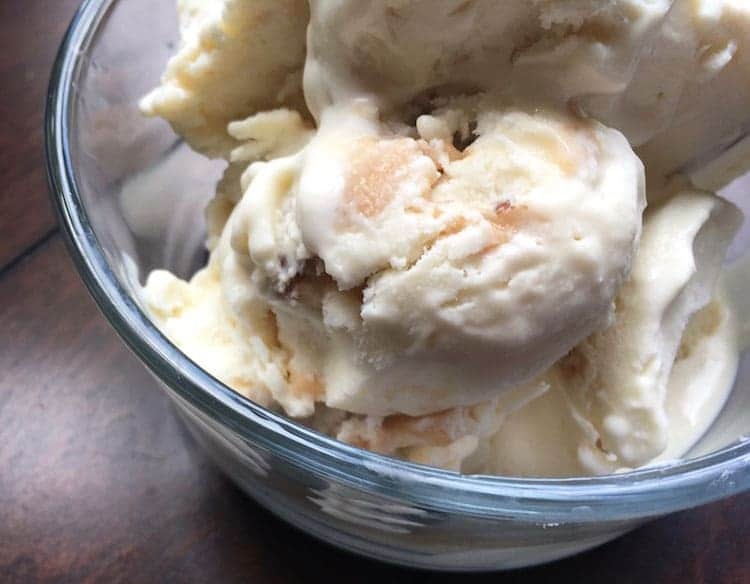 Add in some pretzels if you’d like to make Salted Caramel Pretzel ice cream. Yum! It might be a little difficult to stop at just one or two scoops of this deliciousness. The salted caramel sauce called for a couple ingredients you’ll have on hand, and also fleur de sel salt, which is easy to order online. 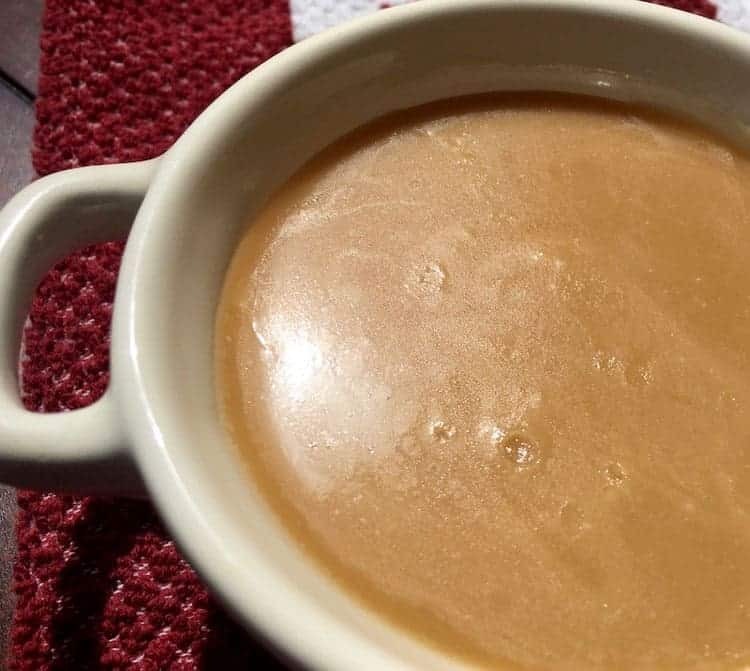 If making ice cream caramel sauce is new to you, you will want to remember this recipe. 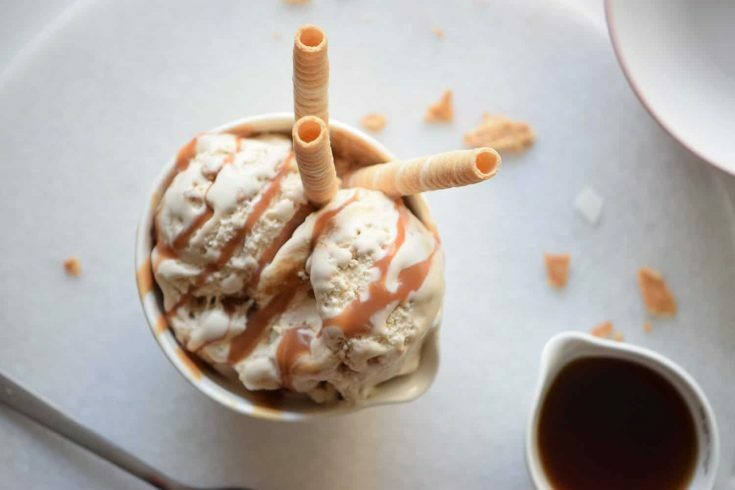 This salted caramel ice cream topping is a sweet and flavorful sauce that is perfect to use on a variety of desserts. There’s no need to save it just for ice cream. Ice cream is one of the best desserts for enjoying the summer weather. What better way is there to cool down from the heat than with a cup or cone of delicious Salted Caramel ice cream? The pecans and salted caramel in this recipe totally take it to an insanely delicious level. Want to mix things up? Try adding in some chopped up candy bars like a Heath bar. Toffee candy would also be divine mixed in to this ice cream. Think toffee ice cream. Which is always a win. Adding another layer of delectable flavor is always a perfect idea! If you’re looking for a tasty way to cool down, this No Churn Salted Caramel Ice Cream will do just that. We’re talking about a creamy ice cream mixed with just the right amount of crunch! We love the salted caramel in this recipe! It is SO delicious. If you want to make it a little darker in color, you can always substitute a little bit of the sugar for brown sugar. You really can’t go wrong with no-churn ice cream. 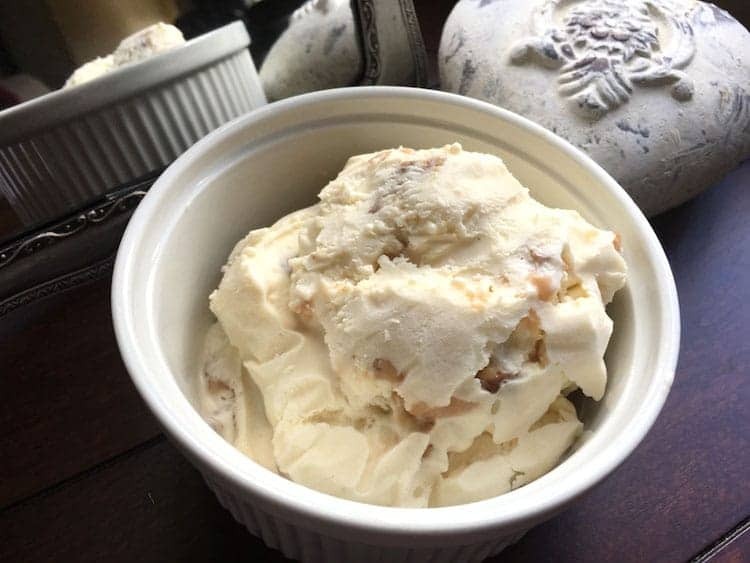 Our Salted Caramel Pecan Ice Cream takes homemade ice cream to a new level, that you will seriously want to try soon! We’ve been busy experimenting with new flavor combinations for no-churn ice cream, so stay tuned! You’ll LOVE our Peach Cobbler No Churn Ice Cream that we’ll be publishing soon. The flavor is out of this world amazing!! Making ice cream at home is fun and easy. With a few simple supplies like loaf pans, ice cream scoops, a good hand held mixer, and ice cream bowls, you’ll be ready to whip up dessert in your own kitchen in no time! Easy no-churn Salted Caramel Ice Cream makes an easy dessert recipe for a homemade ice cream that can be made in no time without an ice cream maker. To prepare the salted caramel sauce, add heavy cream to a small saucepan and set the heat to low. The goal is to slightly warm the cream because you don’t want to add a cold dairy product to hot liquid. Over medium-high heat, add the sugar and water to a heavy-bottomed saucepan and stir to combine. Stop stirring and bring to a boil. Continue boiling until the mixture turns a deep amber color, then slowly whisk in the warmed cream until thoroughly incorporated. Remove from heat and add salt and butter. Stir until butter is totally incorporated into the mixture. Transfer to a serving dish or storage container and allow to cool while you prepare the ice cream. For the ice cream, pour the sweetened condensed milk into a bowl and add the vanilla extract, if desired. Whip the heavy cream in a large bowl with a hand mixer or immersion blender until still peaks form. Add one scoop of the whipped cream to the bowl of condensed milk and mix it in. Then gently fold the rest of the whipped cream into the now lightened condensed milk. Thoroughly incorporate the whipped cream into the mixture, but do not overwork it to the point it loses its airiness. 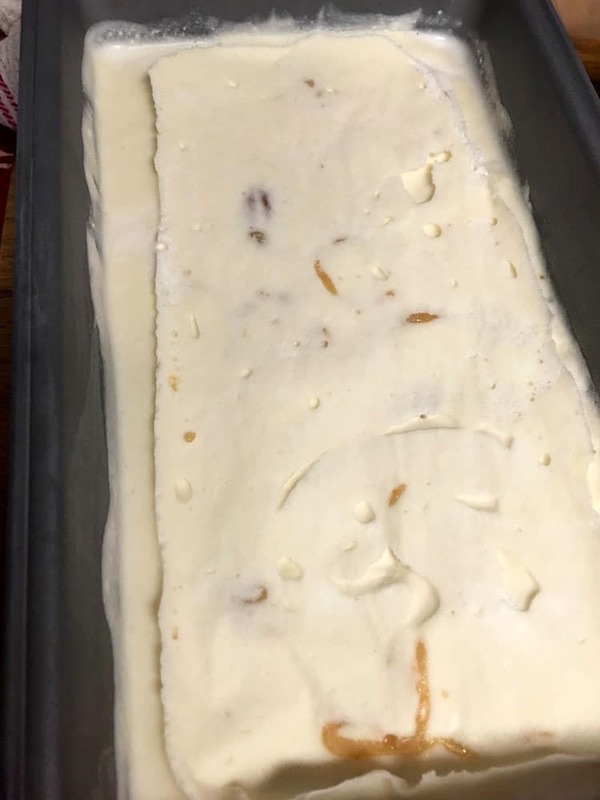 Pour half of the whipped cream/condensed milk mixture into an 8” loaf pan. Drizzle the cooled salted caramel sauce over the milk mixture and spread the chopped pecans evenly over the entire surface. Top with remaining whipped cream/condensed milk. 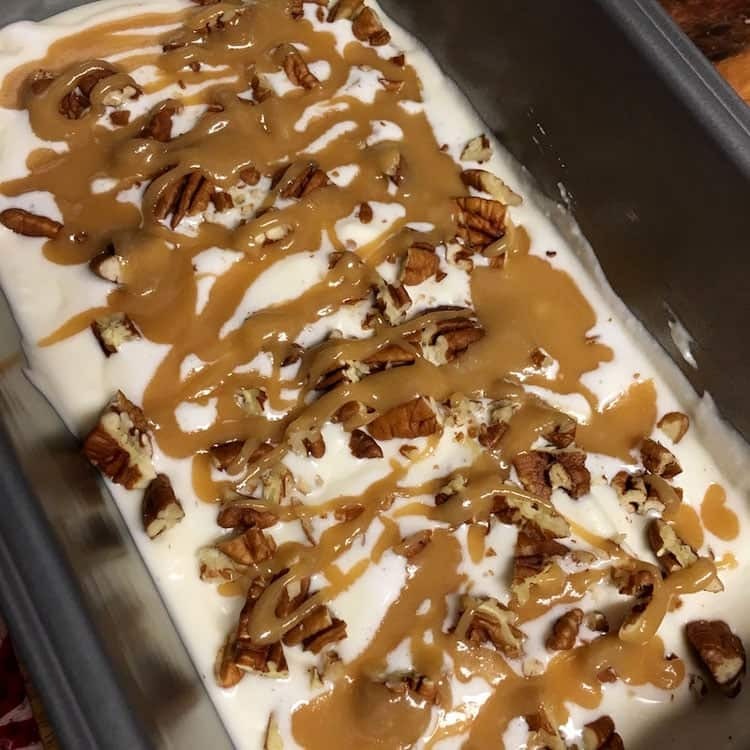 Use a butter knife to incorporate the caramel sauce and pecans throughout the ice cream by pressing it down into the mixture and making sweeping “cuts” back and forth across the entire length of the pan. Cover with wax paper and press down to remove any air pockets. Place in freezer for a minimum of 6 hours, but preferably overnight. Will last up to 2 weeks in the freezer. Store any remaining salted caramel sauce in an airtight container for up to one week. I have met my favorite ice cream! Thank you so much for the recipe. No need to ever buy ice cream at the store. Ah, thanks so much! We have some in our freezer right now too. That and a delicious no-churn Peach Cobbler ice cream that I’ll be posting the recipe for soon. So so good!